Maya Children In Guatemala Are Great At Paying Attention. What's Their Secret? : Goats and Soda Maya kids do better on tests measuring attention, researchers say it's because these kids have something that many American kids have lost. 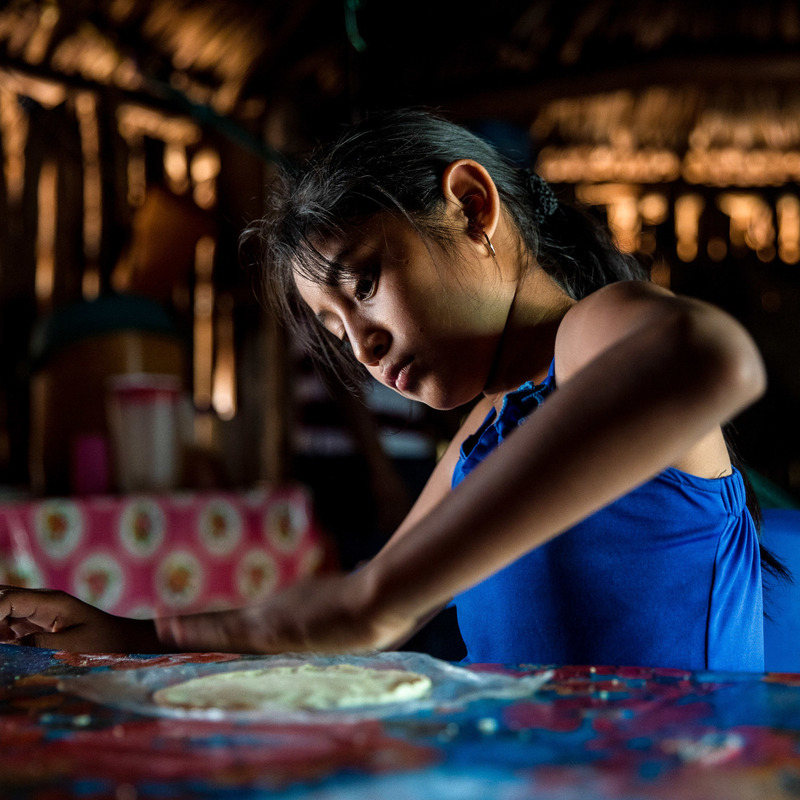 Gelmy Tun Borgos helps in the kitchen making tortillas with her mother in their home in a small village in the Yucatan. Fifteen years ago, psychologists Barbara Rogoff and Maricela Correa-Chavez ran a simple experiment. They wanted to see how well kids pay attention — even if they don't have to. They would bring two kids, between the ages 5 to 11, into a room and have them sit at two tables. Then they had a research assistant teach one of the kids how to assemble a toy. The other kid was told to wait. Rogoff says they would tell the second child, "You can sit over here, and in a few minutes you'll have a turn to make this origami jumping mouse," — a different task altogether. Rogoff and Correa-Chavez wanted to see what the waiting child did. Would she pay attention to the research assistant. Or did she goof off? They ran this experiment on about 80 kids, with two different backgrounds: white, middle-class children from California and Maya children from Guatemala, whom she had been studying for years. Does raising kids have to be stressful? Is it really dangerous for babies to sleep with Mom? Do chores have to be a fight? NPR travels around the world for ideas to make parenting easier. Sign up for NPR Health's newsletter to get the stories delivered to your inbox. Many of the American kids slouched in their chairs, stared at the floor or looked around the room at the posters. One little boy started making explosive noises, pretending a toy on the table was a bomb. "He was throwing his hands into the air and saying, 'It's going to explode!'" Rogoff says. In contrast, the Maya children were more likely to pay attention. Some of them sat perfectly still in the chair, staring at the instructor. The Maya kids showed sustained attention about two-thirds of the time, Rogoff and colleagues concluded. The middle-class, American kids did so exactly half as often. Why such different results? As we recently reported, Maya kids are encouraged very early on to pay attention to what their family is doing so they can learn how to do chores and work collaboratively with their family. But Rogoff and other Maya researchers think there's more to the story. They think these indigenous children have something that many American kids have lost. In the U.S., there's growing concern about the ability of children to pay attention. That, on average, the attention span of kids is declining. But what if it's not attention that's the problem — but something that triggers attention. Attention is a tricky beast. Unlike some brain processes, say vision or the ability to detect faces, there's not one key region in the brain that controls our ability to focus on one task and disregard distractions. "Instead it appears [that] hundreds of different parts [of the brain] have to communicate and interact with each other when we pay attention," says neuroscientist Monica Rosenberg at Yale University. And measuring how well a person's brain can execute this complex process has been thorny, say cognitive neuroscientists Mike Esterman and Joe DeGutis at the Boston Attention and Learning Lab. For years, Esterman and DeGutis have been developing a standard test to measure how well people can focus — or at least that's what they thought they were measuring. "So we bring people in a lab, like college students, and give them these tests to do on the computer, which count how many times their attention lapses," Esterman says. For instance, a person is shown a series of images on the screen. Esterman tells the person to press a button every time a city pops up. "So we show them a bunch of city images," he says. "And you're kind of going along, pressing the button, as city after city passes on the scene. Then all of the sudden there's a mountain scene, and the goal is to stop pressing." If your brain wanders, you'll make a mistake and accidentally press the button, Esterman adds. The more mistakes you make like this, the worse your ability is to pay attention, the researchers thought. "If you do better on the task, it would end sooner," Esterman says. "And you can get out of the lab sooner." In other words, Esterman gave the volunteers more motivation to pay attention. The results were shocking. "The extra motivation increased the person's ability to sustain attention by more than 50 percent, " Esterman says. "We were kind of blown away by the size of these effects." The researchers could even see changes in how the brain worked when people were motivated. The circuitry that controls attention was more active throughout the entire experiment when participants were motivated to finish the test, DeGutis says. Whereas, without the motivation, this circuitry tended to flash on and off. For some people, the motivation can be just as important as their innate ability to pay attention, Esterman says. "If we don't measure how motivated a person is [while taking these tests], then we may not be measuring their true capacity to pay attention," he says. And DeGutis agrees. "One of the things we've realized is that it's hard to separate motivation from sustained attention," he says. "If we're not looking at motivation, then we're really missing the boat in terms of attention." So maybe the Maya children are more attentive in the origami/toy experiment — not because they have better attention spans — but because they are more motivated to pay attention. Their parents have somehow motivated them to pay attention even without being told. To see this Maya parenting firsthand, I traveled down to a tiny Maya village in Yucatan, Mexico, and visited the home of Maria Tun Burgos. Researchers have been studying her family and this village for years. On a warm April afternoon, Tun Burgos is feeding her chickens in backyard. Her three daughters are outside with her, but they doing basically whatever they want. The oldest daughter, Angela, age 12, is chasing a baby chick that's gotten out of the pen. The middle girl, Gelmy, age 9, is running in and out of the yard with neighborhood kids. Most of the time, no one is really sure where she is. And the littlest daughter, Alexa, who is 4 years old, has just climbed up a tree. "Alone, without mama," the little daredevil declares. Right away, I realize what these kids have that many American kids miss out on: an enormous amount of freedom. The freedom to largely choose what they do, where they go, whom they do it with. That means, they also have the freedom to control what they pay attention to. Even the little 4-year-old has the freedom to leave the house by herself, her mother says. 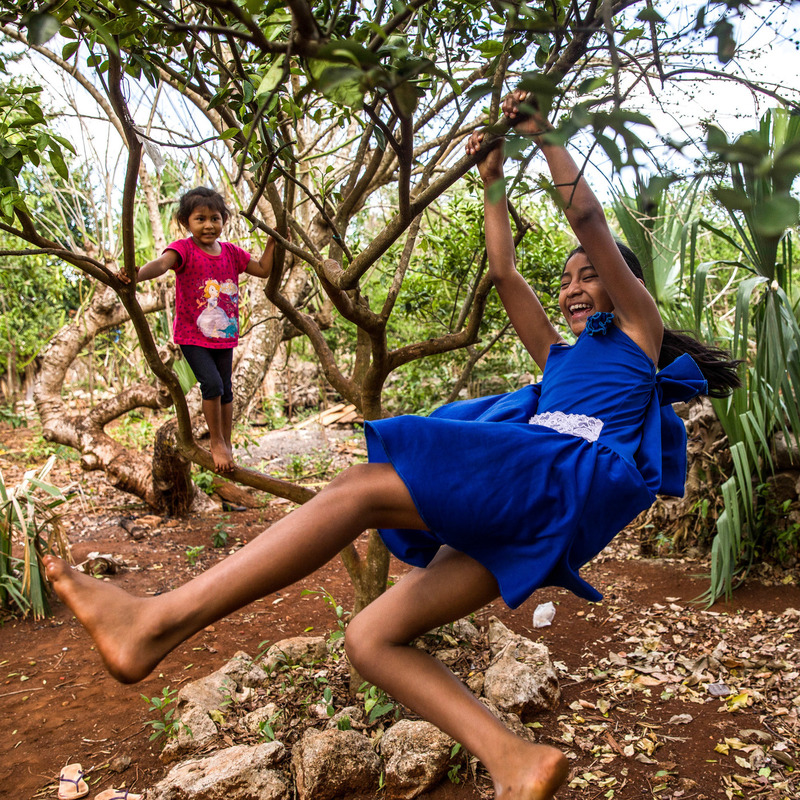 Gelmy, 9, and sister Alexa, 4, climbing trees in the backyard of their family home in the Yucatan Peninsula. "Of course she can go shopping," Tun Burgos says. "She can buy some eggs or tomatoes for us. She knows the way and how to stay out of traffic." Now the kids aren't just playing around in the yard. They're still getting work done. They go to school. They do several after-school activities — and many, many chores. When I was with the family, the oldest girl did the dishes even though no one asked her to, and she helped take care of her little sisters. But the kids, to a great extent, set their schedules and agendas, says Suzanne Gaskins, a psychologist at Northeastern Illinois University, who has studied the kids in this village for decades. "Rather than having the mom set the goal — and then having to offer enticements and rewards to reach that goal — the child is setting the goal," Gaskins says. "Then the parents support that goal however they can." The parents intentionally give their children this autonomy and freedom because they believe it's the best way to motivate kids, Gaskins says. "The parents feel very strongly that every child knows best what they want," she says. "And that goals can be achieved only when a child wants it." And so they will do chores when they want to be helpful for their family. With this strategy, Maya children also learn how to manage their own attention, instead of always depending on adults to tell them what to pay attention to, says Barbara Rogoff, who is a professor at the University of California Santa Cruz. "It may be the case that [some American] children give up control of their attention when it's always managed by an adult," she says. Turns out these Maya moms are onto something. In fact, they are master motivators. Although neuroscientists are just beginning to understand what's happening in the brain while we pay attention, psychologists already have a pretty good understanding of what's needed to motivate kids. Psychologist Edward Deci has been studying it for nearly 50 years at the University of Rochester. And what does he say is one of the most important ingredients for motivating kids? "Autonomy," Deci says. "To do something with this full sense of willingness and choice." Many studies have shown that when teachers foster autonomy, it stimulates kids' motivation to learn, tackle challenges and pay attention, Deci says. But in the last few decades, some parts of our culture have turned in the other direction, he says. They've started taking autonomy away from kids — especially in some schools. "One of the things we've been doing in the American school system is making it more and more controlling rather than supportive," Deci says. And this lack of autonomy in school inhibits kids' ability to pay attention, he says. "Oh without question it does," Deci says. "So all of the high stakes tests are having negative consequences on the motivation, the attention and the learning of our children." Now, many parents in the U.S. can't go full-on Maya to motivate kids. It's often not practical — or safe — to give kids that much autonomy in many places, for instance. But there are things parents here can do, says cognitive psychologist Mike Esterman. For starters, he says, ask your kid this question: 'What would you do if you didn't have to do anything else?' "
"Then you start to see what actually motivates them and what they want to engage their cognitive resources in when no one tells them what they have to to do," Esterman says. Then create space in their schedule for this activity, he says. "For my daughter, I've been thinking that this activity will be like her 'passion,' and it's the activity I should be fostering," he says. Because when a kid has a passion, Esterman says, it's golden for the child. It's something that will bring them joy ... and hone their ability to pay attention. Your Turn: What questions do you have about How To Raise A Human? We've reported on kids and chores, grandma's role in evolution and stay-at-home dads. What else do you want to know? What questions do you have for our correspondents? Submit your question in the tool below. We will pick a few to answer on NPR.org at the end of the series. Submissions for this callout are now closed.